One of our newest men's kimono robes symbolizing wealth and prosperity. This Japanese men's kimono features golden fans against a rich maroon and red background and accented with Japanese calligraphy characters. In Japan, the open fan is a symbol of prosperity and gold fans are believed to attract wealth. Wrap yourself in this comfortable, classic styled kimono. Made in Japan of 100% cotton with a shrink resistant finish, this men’s red kimono is easy to care for. Machine wash cold water for best results. A kimono robe is perfect for lounging around the house or as a cover up after a bath or shower. This men’s red kimono has straight sleeves and includes a matching belt. This kimono is available in size: Medium/Large. Medium/Large, measures 58" in length and is designed to fit a man 5' 9" to 6' in height. The sleeve length is 15" and the shoulder width is 27". Depending on the height of the person, the robe will fall between the mid-calf to ankle. 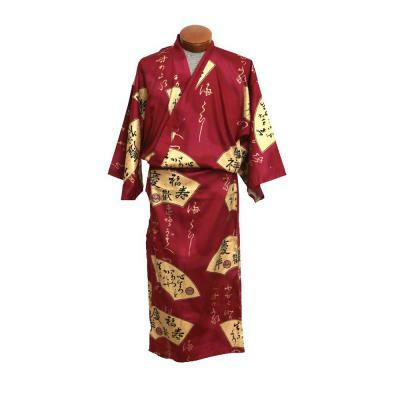 This Japanese men’s red kimono is designed to wrap around the body and adjusts to waist sizes up to 46". If you are uncertain about the length, measure yourself with a tape measure from the top of your shoulder and down your front to determine where the length would fall on you. For a shorter version of this robe, see our selection of happi coats. Buy cotton kimono robes online and get free Shipping on orders of $75.00 or more within the lower 48 states.